I recently reconfigured one of my Dell PowerConnect 3548P switches to prepare it for another task. 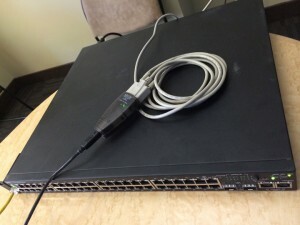 To perform this task, I connected to the serial interface, logged into the CLI console with my terminal emulator and reset the device, and configured an ip address in preparation to use the web GUI. Here’s how I performed these tasks. The first step is to find the serial cable that came with the switch, or any other typical serial cable. Connect it to the back side of the Dell PowerConnect in the serial port interface as shown in the photo. The other end gets a little more involved with today’s computers. 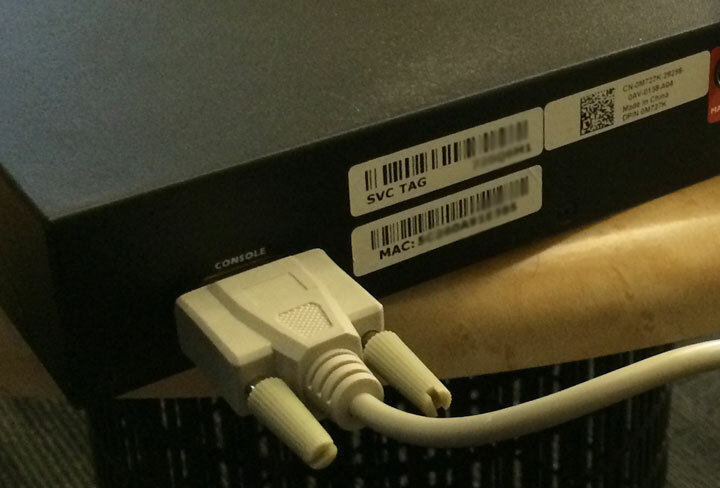 If your computer has a serial port, then you are in luck, connect it there. If not, you will have to find a computer with a serial port, or get a USB to Serial adapter. For this task, I used my Tripp-Lite Keyspan USB serial adapter which I plugged into my USB port and then connected the serial cable to the 9 pin male end of the Tripp-Lite Keyspan adapter. You can see how it connects in the photo. Next, find a terminal emulator that will recognize your serial port. Typical terminal emulators are putty or hyperterm on Windows workstations. I used Zterm on my Mac OS X box. This should get you connected to serial console. At this point, I plugged in an ethernet cable from my workstation to interface e1 of the switch. 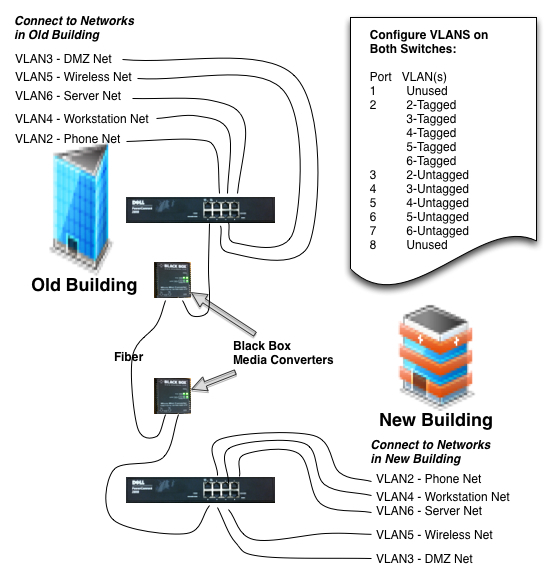 I configured a static address on my workstation and verified that I could ping the switch’s VLAN 1 IP Address. I then took my browser and directed it to the switch’s ip address. I found that while I could browse to it, I couldn’t login. 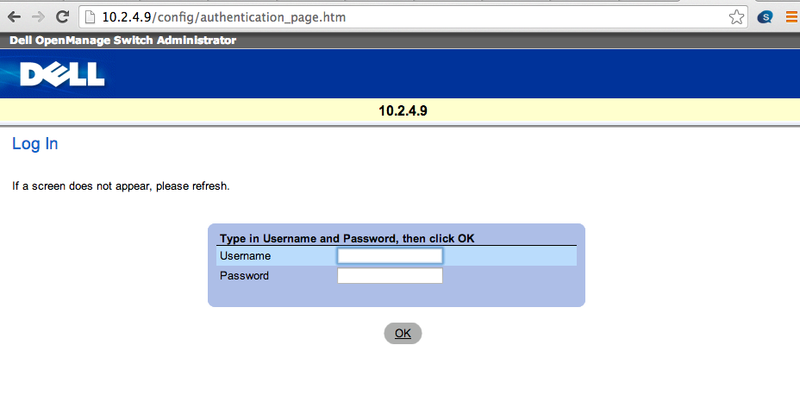 So, back to the serial console to enable an admin user for login to the web gui. That did it. I returned to the browser and am now able to login successfully with the web gui to complete my configuration! At this point, I don’t want to lose any of the work that I have done on my PowerConnect switch, so I will now save my work by copying the running-config to the startup-config. That’s it. My Dell PowerConnect switch is configured with a new ip address on VLAN 1, and I can login successfully using my browser. I am now ready to add any site-specific configuration that I need for my specific needs. Thanks for the helpful info Jeff!